KALINAW, SIARGAO. French-inspired food and beautiful decor. Since we are staying longer, ate well, and did all the activities, we spent P12,500 each. 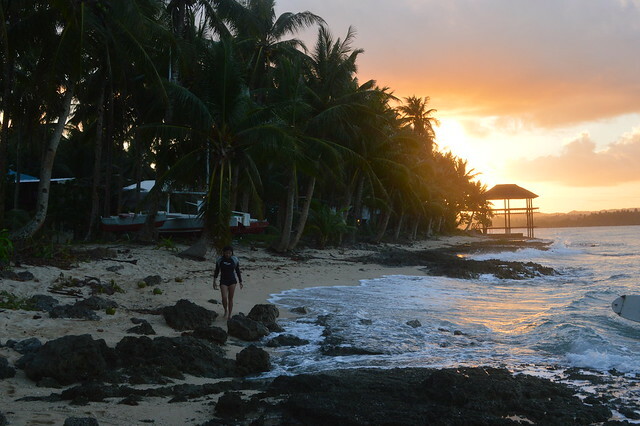 My goal in writing this What To Do In Siargao, Philippines is to be realistic about the budget. 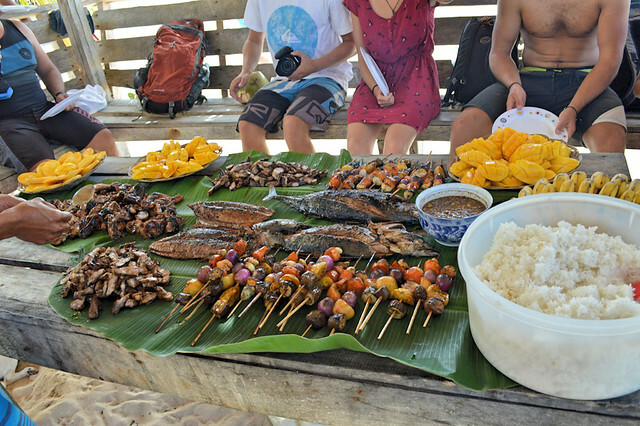 When I was planning the trip, I was lured by these P50 meals I thought I could do it too. 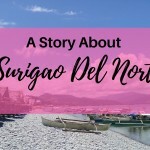 We paid an estimate of P2,800 each for roundtrip flights from Cebu to Siargao. I got these tickets during a seat sale last January 2016. Our travel date was February 2016. 1. Pack Light. DO NOT check-in anything. I’ve gotten the hang of packing as little as possible, a skill I learned from capsule wardrobe. Another goldmine for tips is searching and asking in Quora. I couldn’t stress enough that having no check-in baggage is one of most important, money and time-saving tips I use. 2. Subscribe to airline newsletters and follow them on social media. Most promos come out at midnight. As soon as you see them, book flights right away as they go fast. 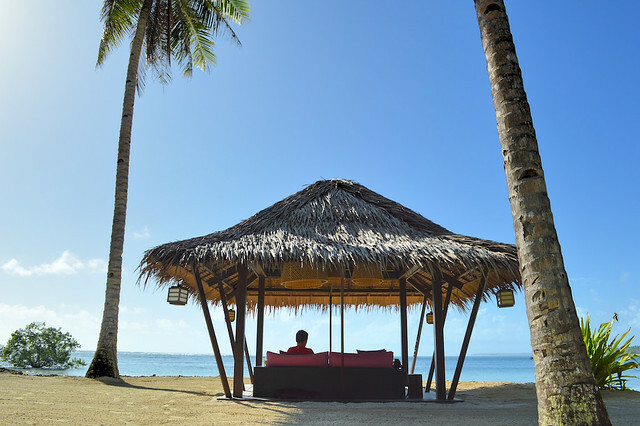 Since we’re staying for 5N/6D, I wanted to get the most value for money in Siargao accommodations. Via booking.com, I found a resort and bar called Kokai. I researched its location, customer’s reviews, and user-uploaded pictures before booking. We loved Kokai! 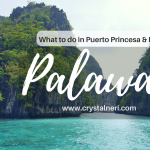 For P1,100 a night, my husband and I got a bungalow with a shared bathroom. – Our bungalow had a queen-sized bed, with plenty of space for the two of us. It can comfortable fit one more extra bed. – In the outside patio, we had a small space for hanging wet clothes, a duyan, small table and 2 chairs where I ate breakfast every morning. I liked how each bungalow is covered with plants – giving some privacy and quiet. – Kokai does not clean rooms every day unless you request them to. I appreciate this because it’s more practical. – The best part about Kokai: The owner, Sandy, welcomed us upon arrival, much to my surprise. He was very helpful and offered to arrange activities if need be. For more details on Kokai, check out this link. 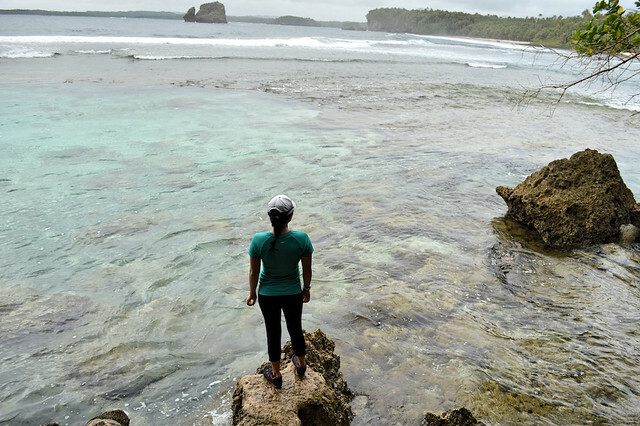 Here’s the beauty about Siargao, there are no taxis, jeepneys or buses. I loved this small town feel. The most common form of transportation is habal-habal (motorcycle) or sometimes a tricycle. From the airport, we arranged a van pickup with Kokai resort for P300 each. A few days later we asked around for prices, but across the entire island, this is what they quoted us. On our first day, we met Arnel (in the picture, wearing gray), a habal-habal driver whom we asked to take us to the market. Since then, he became our tour guide and driver for the next 5 days. The fares usually cost P20 per person each way, but we gave Arnel a bit of a tip for his excellent service. We could just text him and in a few minutes time, he’s there. Our stay at Siargao was more pleasant because of his kindness. 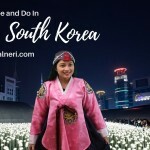 – Arnel was our go-to person for tips on things to do, see and eat. It also helped that we fit comfortably in his motorcycle. One day, he volunteered to bring four pieces of fresh, young coconuts to our bungalow. Mind you ­– these are the sweet kind, not the normal acidic buko. Yum! – At the end of trip, we gave Arnel two parting gifts: my white Nike hat and Jovi’s yellow-green Nike shirt. He kept us safe, informed and happy in our stay; it’s the least we can do for him. The most amazing meal we’ve had in Siargao was Italian food at Kermit. 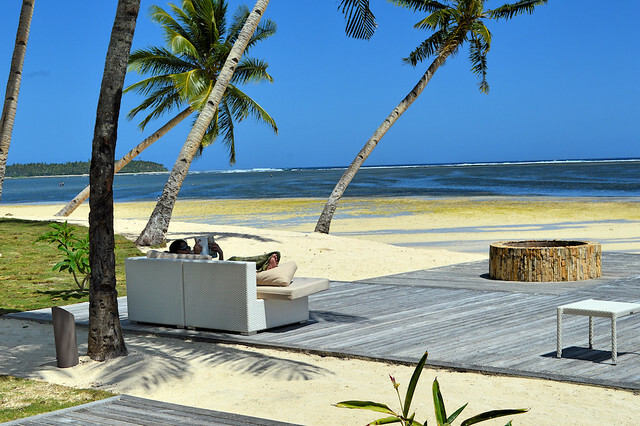 It’s arguably the most famous place to stay in Siargao. We had dinner there, ordering their special pasta and pizza Margherita. I have no proof, but I wish I took photos of my Italian-food-loving husband’s sparkling eyes. With dessert and drinks, our bill came out about P500 per person. Before we left, we saw that the wall was like a giant signup sheet for activities. We wrote our names under “Boating to 3 islands (max 20 people)” for P700 each. Little did we know that the next day, they’d serve this feast. Also worth noting is Mama BBQ’s grilled tanigue (P130) and eggplant (P30). You can never go wrong with grilled seafood anywhere in the Philipines, but the tanigue and eggplant, in particular, tasted like fireworks in my mouth. I wouldn’t mind going back there again multiple times. – Buy in bulk at the palengke (market). I couldn’t find any place cheaper. The large water bottle there is only P35, where any other store would be P40 upwards. Be prepared to balk at resort prices (all of them). One small banana at Kokai was P20. 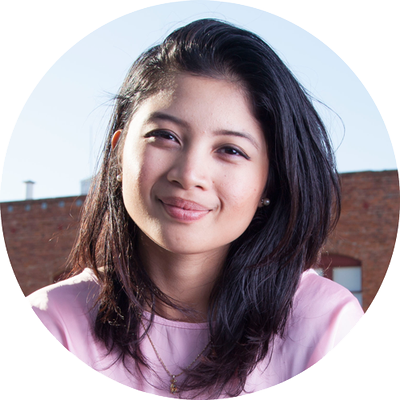 – I was a happy camper just by eating canned tuna, crackers or bread in the morning. I also brought a few packets of green tea with me. My companion skips breakfast, so eating lean in the morning saved us a few bucks. 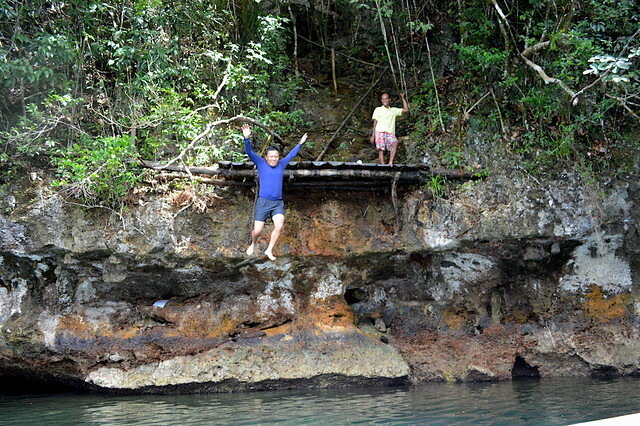 I was first beguiled by Sohoton’s beauty in google image’s pictures of their jellyfish sanctuary. (Go ahead, google it and I’ll wait for you). 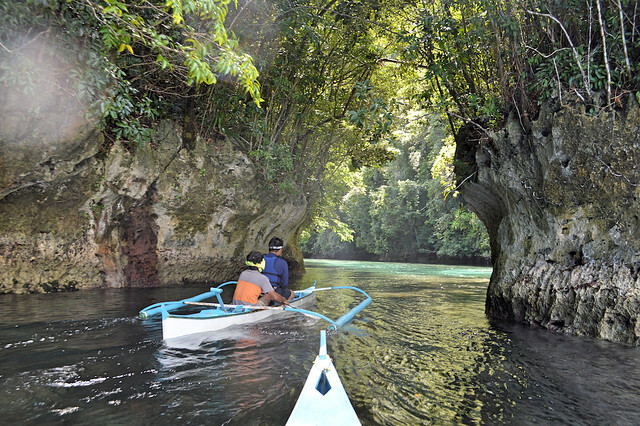 Sohoton Lagoon is an attraction in Surigao Del Norte, featuring caves and unusual flora and fauna. There’s no other way to get there but a boat. 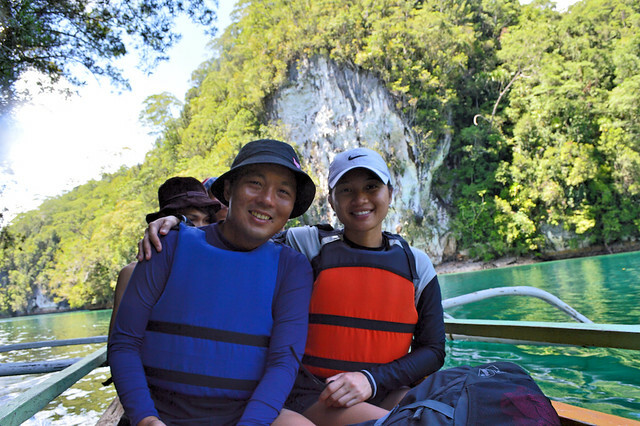 We learned that a basic bangka charter to Sohoton, which will take around 2.5 hours each way to get there, costs P5000 for a maximum of 6 people. Ideally, we wanted to use Romantic Villas’ speed boat, cutting the travel time to just 1-hour each way. 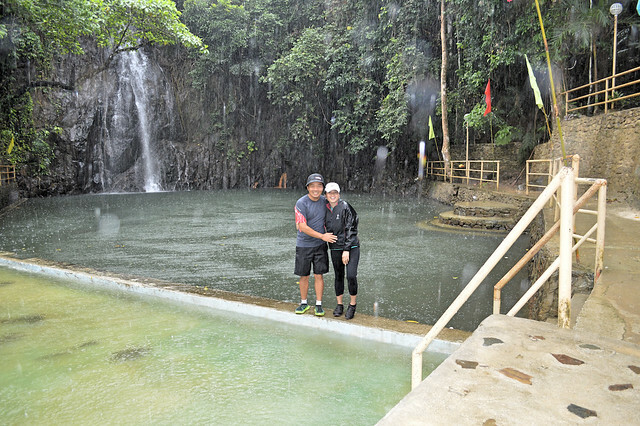 But it was too expensive – P10,000 for a maximum of 7 people. We gave them our number but they didn’t get back to us, probably because they couldn’t get enough people. Beware of other overpriced chartered boats. Keep asking around. 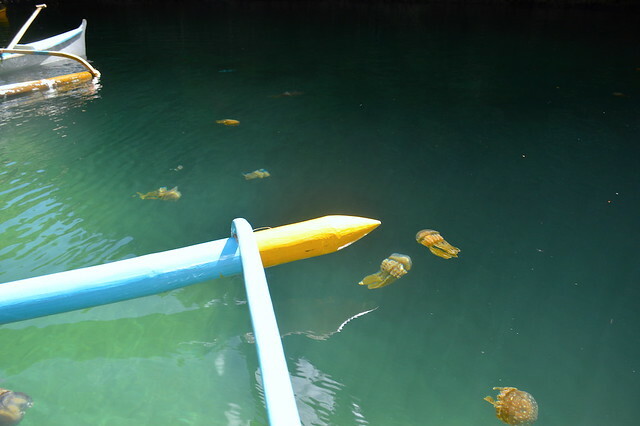 JELLYFISH SANCTUARY IN SOHOTON. Stingless & friendly. – Bring food. There’s food in Sohoton but I wouldn’t bet on it. We bought cooked meals at the market before riding the boat. – Bring earplugs or noise-cancelling earphones. I didn’t have either, so I was temporarily deaf when I left the boat. – Find something comfortable to sit on. I did a combination of sitting on a towel, on my bag, standing up and lying down to support my back. 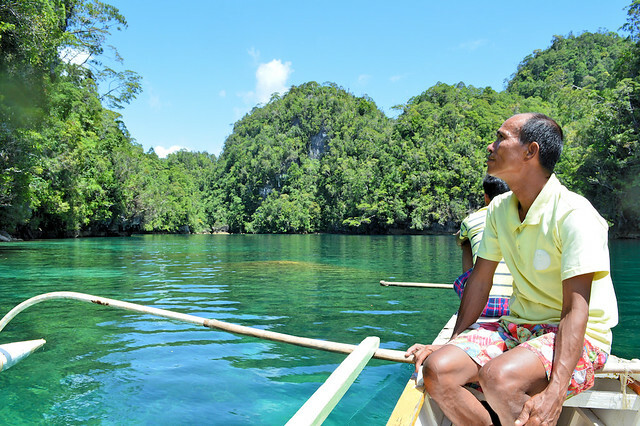 Boating to the 3 islands is a must in Siargao. As I mentioned earlier, we signed up for this in Kermit with 17 other people. We highly recommend it, even if the boat is a little overloaded, it was worth it for the lunch alone. I especially enjoyed Dayum Island’s unique look. 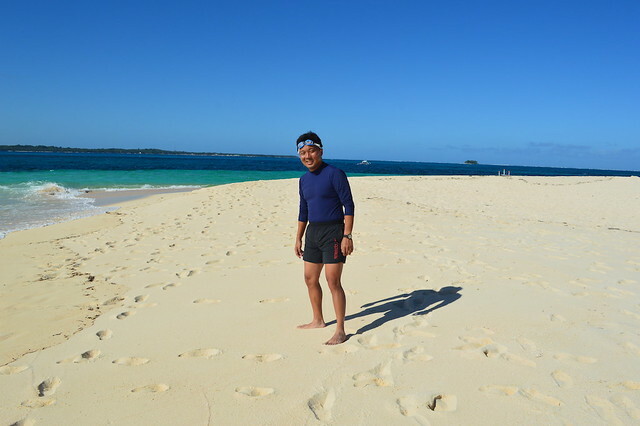 In Dako Island, some of our companions went surfing while my husband and I slept on memory foam-like white sand. – Make sure everything is waterproof. Just once, our boat almost tipped over, so make sure your gear is protected. – The only bathroom with water and trash can is in Dako Island. Dayum’s bathroom is a stand-alone toilet bowl. 1-HOUR SURFING LESSON for Php500. Totally worth it. 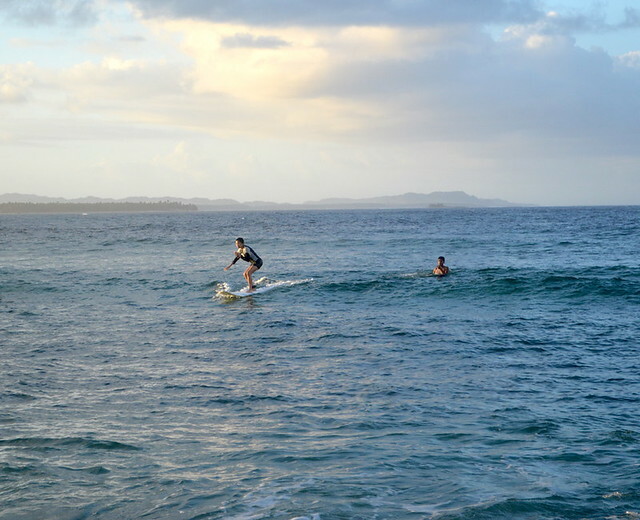 Surfing lessons in Siargao cost P500/person per hour. I almost killed someone and subsequently crashed into sharp rocks, but I avenged myself by standing up on the next push. I’m proud to say that I wasn’t sore the next day (thank you, workouts!) but in my first taste of surfing, I finally understood why in Hawaii, this is their life. I experienced the highs of surfing – how each wave is different and the surreal feeling of controlling it under your surfboard; as well as the lows – tiredness, shaking legs and saltwater in your eyes and ears at every fall. It’s all worth it anyway, when your instructor tells you, “Ma’am buti magaling kayo, ang bilis nyo nakatayo.” High five, Kuya! 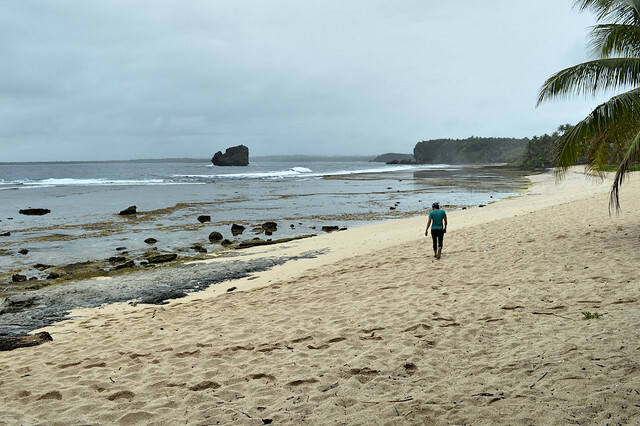 Others will explain this Magpupungko phenomenon better that I can, but the gist is, try to come visit at low tide. It’s so pretty and unique, I wish I could swim in its freshwater pools. 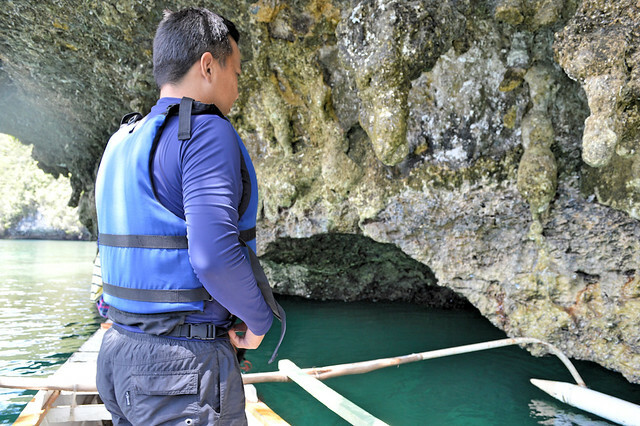 It reminded me of canyoneering in Badian falls, so we did not explore further. There’s a creepy story though: a few years back, a professional diver died there inside during an exploration. His body was never found.